We were contacted by the Nerdy Girls to use one of our posters on the Anniversary for Chuck and we feel honored to make mention and see that what we are doing is making even the slightest impact. And it was funny to read their blog and see that the mention of the kids saying “Computer emergency” as the nerd herd car tumbled down the steps was one of the reasons they tuned in as it was actually one of the things the commercials played over and over that made me want to watch the show initially also. I think the Chuck fan community is a good group of people and together we can keep the show fresh in peoples mind and one day the thought of a Chuck Movie will be a reality. Also Check out the YouTube Video put together by @ Noa_Nerdette with fan comments submitted on twitter – we made it into video! Keep up the strong work Nerds! 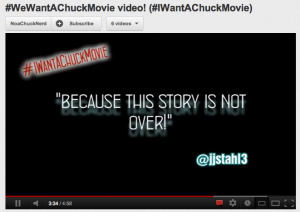 and Happy Chuck Anniversary! You can also still get Free Chuck Movie decals by sending in a self addressed stamped envelope. 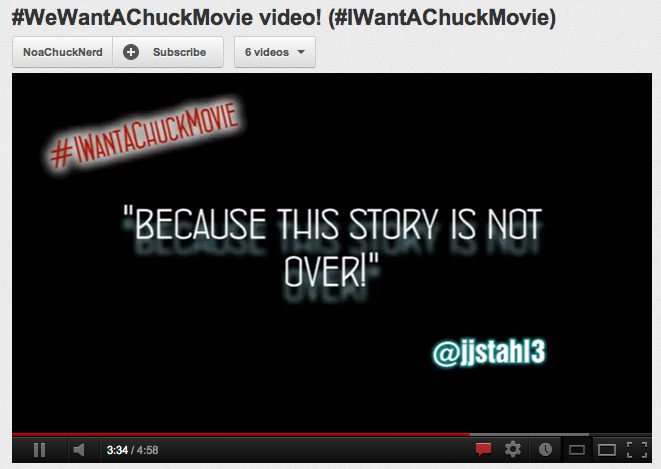 This entry was posted in Chuck vs. The Movie by jjstahl3. Bookmark the permalink.